Every year United Communities staff members and our community volunteers come together for a community wide clean up. Last year we collected trash from our wooded areas, walking and jogging trails as well as common areas all over the community. The cleanup will take place in all housing areas. 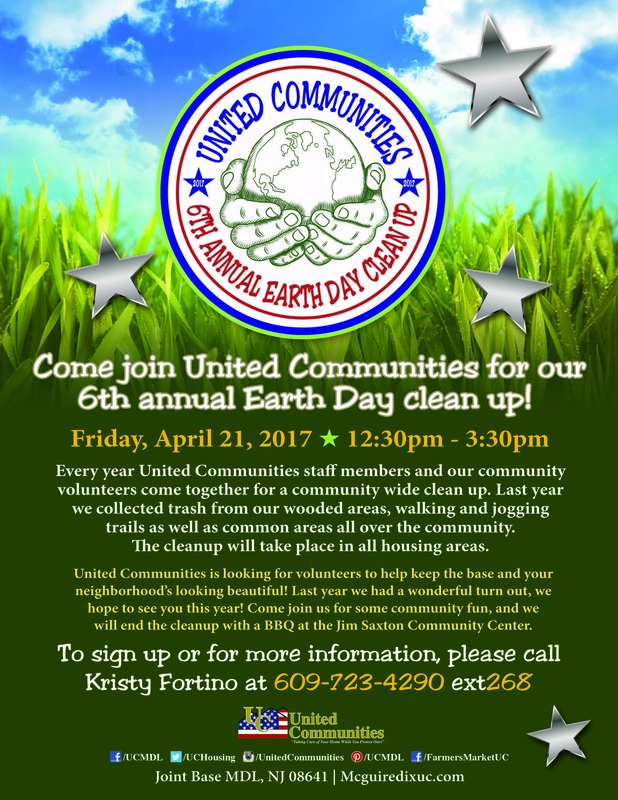 United Communities is looking for volunteers to help keep the base and your neighborhood’s looking beautiful! Last year we had a wonderful turn out, we hope to see you this year! Come join us for some community fun, and we will end the cleanup with a BBQ at the Jim Saxton Community Center. All clean up teams will meet at the Saxton Center for McGuire housing and the Robert Moore Center for Dix housing. Teams will meet at 9am.